When you’ve taken a bit of a hiatus from seeing the dentist, you may be nervous to go back. No matter what your reasons are for avoiding dental care, the important thing everyone at my dental office in Long Grove wants you to know is that now you’re considering coming back, nothing makes us happier. No matter why you stopped visiting your dentist in Long Grove, you’re not alone. 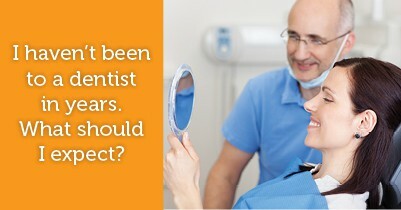 Many people have had experiences that keep them from wanting to see the dentist. Perhaps a negative experience left you scared of the dentist, or you moved to a new area and haven’t found a dentist you trust. Whatever your reason, we understand and we’re glad to have you back. If you’re ready to see a dentist again, we encourage you to call my Long Grove dental office. We welcome you to come experience our service and our office personality. From the beginning, we’ll talk about your concerns and work with you to get your smile strong, beautiful, and healthy. Serving patients in Long Grove, Buffalo Grove, Lake Zurich, and surrounding areas.